The Canadian economy continues to siphon the last few drops of GDP out of it’s broken well. The remaining growth appears to be oozing out from inflated real estate markets in Vancouver and Toronto. 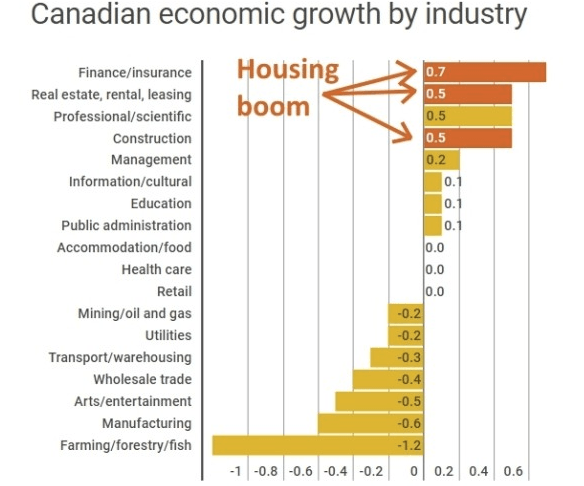 The latest data from Stats Can shows no growth for the month of February and virtually all of that growth coming from a historic housing boom that governments are finally trying to reign in. Canadians are taking full advantage of historically low interest rates. In the Greater Toronto Area, the number of borrowers that own more than one residential property grew by roughly 30% between 2014 and 2016. I’d imagine the number is similar in Vancouver. As prices continue to grow, so too does leverage. People taking out high-ratio mortgages combined with incomes too low for the property value, is spreading across Canada. Is it any wonder prices are climbing at a torrid pace. Recent Bank of Canada statistics shows household credit continues to grow, up 5.1% year over year, nearly 72% of that credit is mortgage debt. With the Bank of Canada reluctant to hike interest rates and governments determined to keep the economy afloat household debt seems likely to balloon even further, and perhaps house prices too. Until credit begins to slow don’t expect much to change, although Canada’s largest alternative lender being on the brink of collapse might be the catalyst.